Licence Free Radios Need A Walkie Talkie? What is a radio licence and do I need one? 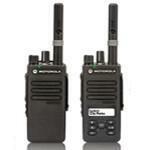 There are two types of two-way radios, licenced radios and licence-free radios (PMR446). Licenced radios require a dedicated frequency which ensures that only those on that frequency can hear transmissions. In order to access a dedicated frequency, a radio licence granted by Ofcom is required by law. Licences start at £75 for five years. Licence-free radios (also called PMR446 radios) operate on the PMR446 radio frequency, they can be used by anyone within the UK and EU and as the title suggests they need no radio licence. 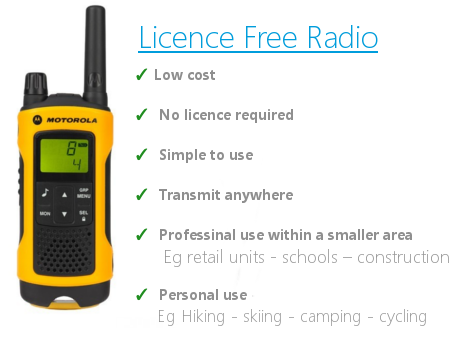 Licenced radios are usually more expensive than licence-free models, but have a larger power output (of up to 5 watts for handheld radios) and so offer increased range and coverage. For example a primary school would typically find coverage on licence-free equipment sufficient whereas licenced equipment would be better suited to a secondary school, college or university. In addition, a licence will offer increased security of transmissions through better monitoring of frequencies, especially if the licence is specific to your site. 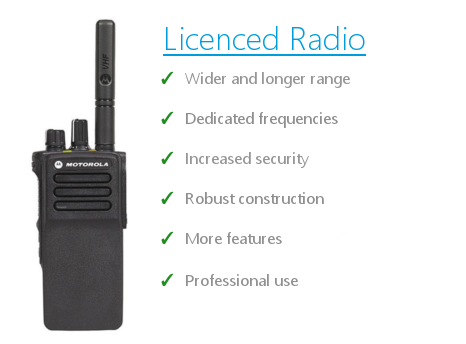 Licenced radios are generally more robust, with clearer audio quality and the conversation more secure. Licensed radios also offer much more functionality than license-free radios, you can make group calls, send text messages and dial up individual users. In order to obtain your licence, an application to Ofcom has to be made. 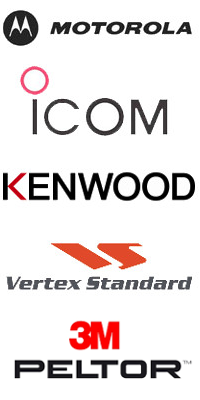 We are more than happy to apply on your behalf and offer a managed service in order to maintain your Ofcom licence throughout your radio project. Or if you wish to make an application yourself, please feel free to ask us any questions along the way as we have vast experience in completing these forms and can go through it with you over the telephone. The application process is usually complete within 20 working days. Non licensed radios are a cheaper alternative to licensed radios and can only have a power output of 0.5 watts giving them a fairly small range. Licence-free radios can be used in the work place and for personal use, ideally where minimal coverage is needed, within small buildings where users are communicating in a close range. Examples where these radios can be used effectively include smaller schools and construction sites, warehouses, hospitality venues and independent retail businesses. For leisure they can be ideal for communicating between friends and family while camping and skiing, or if you are at a leisure park or hiking. All PMR446 radios use the same eight channels. If there are a high number of users in a given area (cities and other built up areas) frequencies become extremely congested leading to interference on the channels, although usually there are multiple channels to select in order to find a clearer channel. 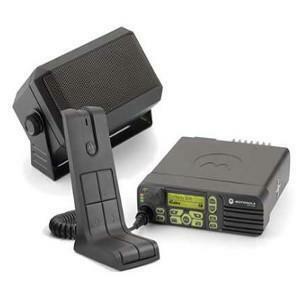 Radio Solutions supply mobile radios Worldwide.